There is no weight at which drinking Coca-Cola (or any other sugar sweetened beverage) is suddenly less bad for you. There's also no amount of exercise that you can do before you drink one that's going to change the fact you're drinking, in the case of one of their ubiquitous 20oz bottles, 16.5 teaspoons of sugar and the calories of a large chocolate bar. Yet Coca-Cola, go figure, is "Coming Together" to try to convince people that exercise makes drinking Coca-Cola A-OK.
"The statistics say that 70% of Chileans sedentary lives. The good thing is to lift a finger, can be the beginning to change this. Coca-Cola presents: Taxi movement. The more you pedal, the lower your fare. Combine Physical activity with moderate and balanced diet to manage weight. How much are you going to move today? Movement is happiness. Happiness is movement." So there you have it. To paraphrase, if you "Balance" your dietary choices with physical activity - you're golden. Happiness is movement. And what else is happiness? 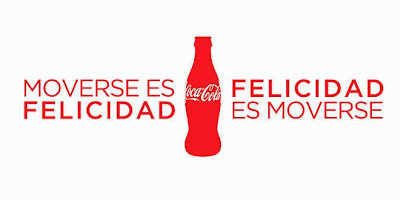 Well it's Coca-Cola of course, as just like here in North America, Chile's Coca-Cola campaign involves opening happiness or, "destapa la felicidad"
Now don't get me wrong, if you love Coca-Cola, drink it, but only drink the smallest amount of it you need to enjoy your life. That said, just don't forget that exercise and/or a low body weight certainly won't make that beverage any less unhealthy. And if you think for one moment that Coca-Cola's "Coming Together" to do anything other than sell more Coca-Cola and forestall industry unfriendly regulation, then I think you've let the bubbles go to your head.